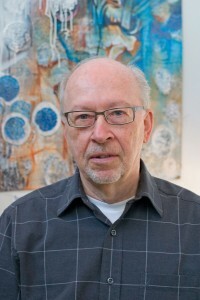 Gustavus Adolphus College Professor Emeritus Bruce McClain taught in the College’s Art and Art History Department for 46 years from 1965 to 2011. On Thursday, June 20, Mankato Free Press reporter Tanner Kent featured McClain and a current exhibition of his work that is on display at the Waseca Arts Center. Kent writes: Those familiar with Bruce McClain’s paintings may find it hard to imagine the highly regarded artist idly meandering his studio. But even the man whose artwork can be found in such impressive collections as the Milwaukee Art Center, the Whitney Museum of American Art in New York and the Smithsonian National Air and Space Museum admits to moments of creative malaise. “If I’ve not been working in a while, I really question that I can still do it,” said the retired Gustavus Adolphus College art instructor who’s exhibiting his most recent works at the Waseca Arts Center through July 27. The entire story can be read on the Mankato Free Press website.